South Africa faces a unique set of technological problems and this week Click is looking at how those challenges are being met with some pretty inventive solutions. Getting software to those who could put it to good use and then teaching them how to use it is a huge hurdle. South Africa's younger generation are growing up in a very different country to their parents but many schools still face massive shortages of text books and resources. Kids could face bus journeys of two or three hours a day just to get into the same room as a specialist teacher. 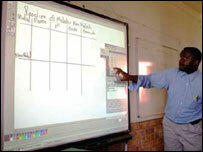 In Pretoria, a bunch of school kids are testing a possible solution to the distance problem. A morning's lesson takes place at the local Gatang School, but their teacher, Ron Beyers, is giving the lesson from St Albans College, several kilometres away in Pretoria. It is possible thanks to a five megabits per second (mbps) satellite link that uses networking technology developed by Motorola. Video and sound from Ron's lesson is sent live to several schools at once. Importantly, the link is two-way. If kids from any school have a question, they ask Ron through a microphone at the front of the class. For even more of an interactive feel, they are often asked to use the Smartboard - a motion sensitive white board type display which is projected onto the wall of every school taking part in the lesson. Although this project was funded by Motorola, Mr Beyers does not think it should always be like that. "I believe this type of project has to become the responsibility of the government," he said. "It's one of their primary functions to provide education, and in the modern technological world we need to be able to provide access to information. "Without that the students aren't going to be able to cope in a technological world." Of course the more students who have access to quality teaching the better, and it is claimed that the Canopy network could easily be extended to cover distances of more than a 100km. Right next door to one of the city's wealthiest districts sits one of its poorest: the township of Alexandra. The sprawling mass of shacks is home to a million residents and whereas wiring everyone up to the phone network just will not happen, wireless technology could once again triumph. Alexandra happens to be close enough to its rich neighbour's mobile mast to be covered by a wireless technology known as HSDPA - High Speed Downlink Packet Access. One local entrepreneur is taking full advantage of the cross-over in coverage. Joe Matlou runs a community payphone kiosk. As well as making mobile calls the big draw here is broadband speed net access through HSDPA. Instead of blowing all the bandwidth on one machine, the signal is shared between two dumb terminals, fed by laptops in the back room. "We've been so popular that we started by buying 1GB a month, and now we buy 3GB a month," Joe told us. "We're so popular that we have to turn customers away because of only having two terminals. We're looking forward to expanding the business." The network provider behind the project, MTN, is planning to implement similar kiosks elsewhere to save township residents arduous journeys to internet cafes further afield. Bornman Du Toit from MTN explained: "Now the 20 or 30 rand (£1.45 - £2.17) that they had to pay for taxis they can now save and use to pay for internet usage and potentially still have money in their pockets. "And they can stay the entire day because they do not have to stand in a queue and so on." In Peebles Valley, a small rural community in eastern South Africa, they demonstrate how tin cans could link the people of this community with each other, and the wider world. To prove the point Click visited an Aids clinic where 2,000 patients receive treatment. The clinic has long had a satellite dish to access its online database, but until recently the idea of making contact just over the hill was a different story. Clinic manager Harry Munnings said: "The biggest problem was the communication between the clinic and the community hospice; the doctors are at the clinic and the nursing team is at the hospice, and if they ever wanted to call the doctors it could get quite complicated." No landline or mobile signal, and two places several kilometres apart who needed to talk to each other. Cabling an area like this is too expensive, so some kind of wireless link would seem to make sense. However, a conventional wi-fi network setup does not have the range. A regular wi-fi aerial ripples the beam out in every direction, which limits how far it can travel. And that is where tin cans combined with antennas come in - the so-called "cantenna". 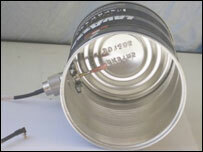 Stick the antenna inside the can and the can's shape and characteristics focus all the energy of the beam in one direction. It is astonishing to think a cantenna can push a signal across such a distance, but there are some drawbacks. Over time, they rust, which means they need to be replaced. More significantly, cantennas need a direct line of sight to each other, or they will not work at all. That is a problem in this hilly terrain. So the answer is to connect the clinic to the hospice indirectly, using other cantennas dotted around the hills in a so-called mesh network, which seamlessly passes the signal from one point to another. The benefits are huge. The hospice has got online and is connected directly to the clinic. Nurses use voice-over-internet calls back to the clinic, and they have access to the online database of patients too. And what is really cool is that everybody else involved whose cantenna links to the network gets on the network too. This means they get internet access, can send instant messages, e-mails and make net phone calls. Microsoft is well-known for providing heavily subsidised versions of its software for use in the developing world, but for a society where any money is best spent on the basics, software that is completely free is a bonus. Ubuntu is a version of the free open source operating system Linux. Backed by South African internet entrepreneur Mark Shuttleworth, it comes with a range of software, like office programs, e-mail, a web browser and a media player. And Intel is working with the Ubuntu community to create a version of the OS for mobile devices. Mark Shuttleworth told us why he'd decided to adopt Ubuntu: "I fund Ubuntu because you can create businesses using Linux in South Africa, which I didn't think it was possible to create with proprietary alternatives." Linux has a reputation though of not being that easy to use. But Mr Shuttleworth disagrees: "In many cases it's because you've got people trying to do complicated things." "It is in fact very easy to use, especially if you've never used anything else. We've seen great results in Brazil, for example, where huge deployments of Linux have been done in schools and in community centres. "It's people's first experience in technology and they love it. They very quickly figure out how to do the things that they're interested in doing."